Goatfishes have two barbels under their chins, which look like a goatie beard. They eat worms and crustaceans found in the loose sand. They are sociable. They turn red when dead. Goatfishes are found in all tropical to subtropical regions of the world (Miocene to present). These fishes have two barbels extending under their chins, which usually lay flat against their chins. With these barbles, which act like tongues, they can stir the bottom and taste what lives there. They like to live in sheltered waters, which is also home to their prey. 50-60 species world-wid, in NZ only three species are found, one of which is common and which breeds here. Goatfishes which are perhaps the most beautiful fishes we have, are a common sight. They can change colour rapidly and they can camouflage themselves by looking like the sand. They feed by stirring the sandy bottom with their barbels. With these barbels they taste what is there. The common goatfish is one of the most beautiful fishes in our country. It can change colour rapidly from a sandy colour to bright red. At night when resting on the bottom, goatfish are particularly beautiful. They are found in tranquil waters above the sandy bottom, either in the deep of exposed rocky shores or in the shallows of sheltered shores. Inside the Hauraki Gulf, the goatfish is numerous. With its sensitive barbels it can find its food easily and thus spends much of its time resting or socialising in groups. The goatfish is an elongate, bottom-living fish of inshore waters that ranges in length from 15 to just over 30cm as an adult. Small goatfish feed for most of the daylight hours, usually foraging on the bottom in loose schools, eating mainly small crustaceans and worms. In contrast large fish spend much of their time resting in groups on the bottom and appear to have preferred gathering areas where large numbers of individuals may be seen lying close together. These same rest areas are used day after day for many years. Groups contain typically 20 fish with 2-3 males and 5-6 mature females. Large individuals feed mainly on blennies and triplefins and can often be seen hunting these small fishes around crevices and boulders. Sometimes groups of large goatfish hunt in a pack, gathering around a suitable crevice or large sponge colony and frantically waving their barbels over the bottom to herd the small fishes together so they can be caught more easily . Goatfish, sociable as they are, like to be groomed by cleaner fishes and spend far more time than other fishes seeking cleaning services in areas where they are available. 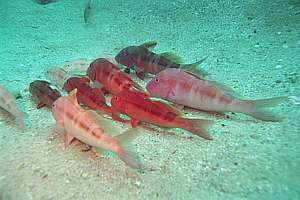 Sometimes dozens of goatfish can be seen clustered around a crimson cleaner fish or combfish, patiently waiting their turn to be inspected for parasites. 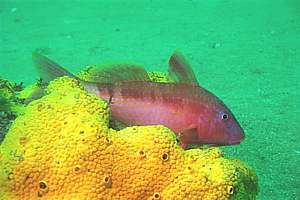 Fishing: Goatfish are occasionally caught on a small hook and make excellent eating but they are not fished commercially. Description: A steeply sloping forehead ends in a small downward facing mouth and beneath the chin are a pair of conspicuous long barbels. This pair of feelers, which is a feature of all goat-fishes, is used to dig in bottom crevices or sediments to disturb invertebrates or small fish that are quickly snapped up. There are two separate dorsal fins, the first high and triangular and the second longer and more rounded. Goatfish are variable in colour. Small individuals less than 20cm long, are pale pink-brown above, white below, and have a line of dark brown squarish splotches along each flank. The fins are yellowish, often tinged with blue. Larger specimens have this same colour pattern when feeding or swimming but are differently coloured when resting on the bottom. At these times the entire body and fins are suffused with bright red, there is a pale blue spot on each body scale, and blue markings on the head and fins. The line of brown markings on the flanks becomes a dark red-brown. Courting males are similarly coloured but are blue tinged pink rather than red and have bright blue markings on the fins. At night, or when removed from the water, goatfish are bright orange-red splotched with white. Fins: Two dorsal fins; D VIII+I 8; A II 6; P I 5; LL 29; Length 15-30cm. Maximum 45cm at 400g. Large scales. Life history: The life span of this species is unknown. Juveniles settle out of the plankton when they are 3-4cm and still a shiny silvery colour, which changes rapidly to white. By the end of their first year these fish have reached about 13cm in length. Then growth slows and 2 year old fish measure about 16cm. Distribution: This species is found on rocky reef areas or on sand patches near reefs from depths of a few metres down to about 100m. They are common around the North Island and the northern part of the South Island as well as being abundant around most of Australia. Fish counts made by divers around eastern Northland show the goatfish to be the most abundant of the larger reef fish and numbers of about 10,000 per Kilometre of coastline were recorded. In Australia this species is known as blue spotted goatfish, black-striped goatfish and red mullet (Upeneichthys vlamingii). 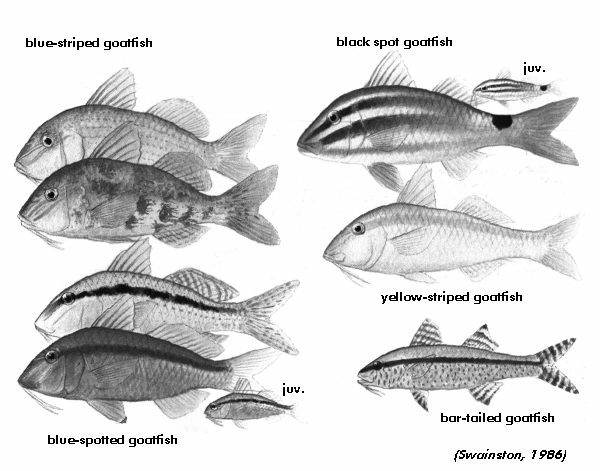 In the drawing below (from Hutchins & Swainston), the following goatfishes are shown: blue-striped goatfish (upeneichthys lineatus), black spot goatfish (Parupeneus signatus), yellow-striped goatfish (Mulloides vanicolensis, Parupeneus chrysopleuron), bar-tailed goatfish (Upeneus tragula) and the blue-spotted goatfish (Upeneichthys vlamingi), which is assumed to be identical to the NZ one. The black-spot goatfish is very similar in shape to the common goatfish but grows to a larger size, attaining a maximum length of over 40cm. During warm summers it is found in the warmer coastal waters of NE NZ. Normally a sociable animal, the 'stragglers' found in NZ are usually alone or in very small numbers. Consequently they seek to socialise with fish that look like them. They are often found trying the company of young Sandagers wrasses and female crimson cleanerfishes who also have a black spot on their tails. But this leads to much frustration because these two species hardly sit still for a moment and swim well above the bottom. Black-spot goatfish of anything over 20cm have not been seen, suggesting that this species does not survive our cool winters and that it does not reproduce here. Description: Body colour of this species varies from almost white to a dull red with an overlying pattern of four broad longitudinal yellow-brown stripes. These begin on the snout and run to the caudal peduncle where they fuse around a large black spot on each side of the upper caudal peduncle. Fins: D VII+I 8; A I 6; P I 5; LL 29. Length 10-15cm. Distribution: This species is widely distributed in shallow water in the tropical Indo-Pacific region, and small numbers have been found in warm years around some of the offshore islands of Northland's east coast, especially at the Poor Knights Islands. The bar-tailed goatfish is even less common than the black-spot goatfish. Description: The bar-tailed goatfish is more elongate and blunt headed than either of its New Zealand relatives, and is markedly smaller, averaging only 10 to 15cm in length. In its natural habitat this species is pale fawn in colour with a pink tinge on the back and silver beneath. The fins are translucent with thin yellow-brown longitudinal bands and the tail has a stripe of the same colour running the length of the lower fin lobe and three transverse bands across the upper lobe. This unusual irregular tail patterning is the most obvious distinguishing feature of this fish. Fresh dead specimens are red-pink with bright red bars on the fins. Fins: D VII + I 8; A I 6; P I 5; LL 29. Size 10-15cm. Distribution: This fish is found throughout the Indo-Pacific from Japan to Australia and a few specimens were seen at the Poor Knights Islands off the east coast of Northland in 1971. It is likely that this goatfish is an irregular visitor to New Zealand drifting across the Tasman Sea during the larval stage in years when the summer water temperatures are high.